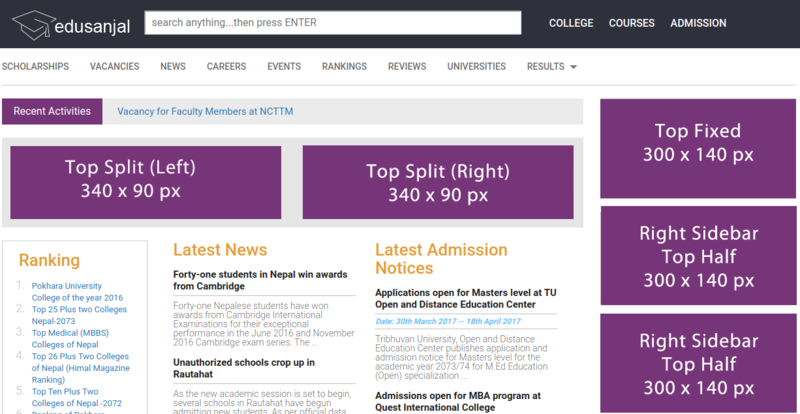 Want us to help you to reach prospective students or want to build a strong online presence in exponentially growing education website of Nepal? send us email with your requirements at info@edusanjal.com, our marketing department will guide you to devise best method to reach prospective students. Why to advertise in edusanjal? Long gone are the days when colleges depended only on the brochures and seminars to attract the students. Many of the colleges now devote large chunks of their websites to grab the attention of the students. But Students won’t visit every college’s website just to find their ideal course, and with edusanjal they don’t have to! In edusanjal.com, users can search through all the programs available in Nepal by location, key word and subject area. Here at edusanjal, we bring together all the study opportunities from all the colleges and universities operating in Nepal into one central, searchable database. In recognition of the increase in online usage recorded in our country, we have developed sophisticated online advertising options to ensure that your promotions are seen by a wide audience of professionals, guardians and targeted students directly interested in the course/program you are offering. So, don’t miss out- if you’re not listed, they might not find you. edusanjal.com is the only and largest Nepalese database of all the courses offered in Nepal, colleges and universities operating in Nepal. edusanjal.com is the major attraction of large number of prospective students you are searching for particular college/course. We offer attractive rates and a flexible pricing model, allowing you to decide how to spread impressions over time. edusanjal.com will work together with you to meet your specific needs, offering you the flexibility and functionality that you expect. This is the most premium feature and is suitable for college or organization which want to gain attention of all the visitors of edusanjal for a period of one day. This advt of 640*480 px runs for a period of 24 hours and will be shown to every unique visitors/visit. Every person who visit edusanjal on that particular time period will see your advt for a period of 7 second. If interested he/she can click the advt and reach to destination url. Being a member of edusanjal.com: For member colleges we will host full detail content of the college, verified (badge) in the profile and very attractive packages on yearly basis. BANNER ADVERTISEMENTS: We post limited banners in the site on weekly/monthly basis. For pricing email us at marketing@edusanjal.com or call us at 9849038845/9851186096 (Yadav Kumar Pandit ). Emails will be responded within 24 hours. Advertising Jobs, admissions notice, Training programs or events. For quotation, email us. Bonus point: We share and tweet every jobs, admission notice, training program and events. Every email delivered to marketing@edusanjal.com will be responded within 24 hours.